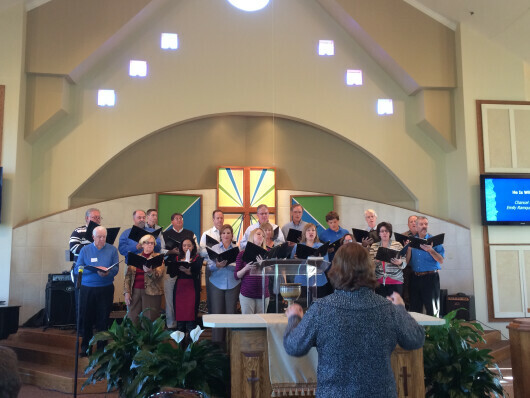 Chancel Choir -- Rehearsals are at 7:00 p.m. on Wednesdays. The choir provides special music at both services from September thru May. Bell Choir -- Rehearsals are at 6:30 p.m. on most Wednesdays from September to May. The bell choir provides special music several times throughout the year and at special services such as Christmas Eve. Key of G -- Our worship band rehearses at 7:30 p.m. on most Thursdays throughout the year. The band leads worship at both services every Sunday. Back Row Boys -- Our men's chorus rehearses on an as-needed basis and performs at both services several times throughout the year. Special Performances -- Soloists, instrumentalists, and small groups are always welcome. Angel Choir - Kids, if you like to sing and are in kindergarten through 6th grade, come join us in Angel Choir! Rehearsals are Sundays during the school year from 10:00 to 10:25 AM. We meet in the choir room at the top of the stairs, the room facing the parking lot. For more information, contact Martha Thieme. The Sound and Video team at New Hope is a key ingredient to our worship services. Team members may specialize in either sound, video or both and serve on a rotating schedule throughout the year. For more information, contact Wes Shealey.